Thelma McQuiniff, 96, a 40-year member of the Riverview Hobby Club, is all smiles about the cowl one of her fellow members made by hand and gave to her as a gift. The club meets from 9 a.m. to noon every Thursday at the Riverview Civic Center. You can find Thelma McQuiniff at the Riverview Civic Center every Thursday morning. 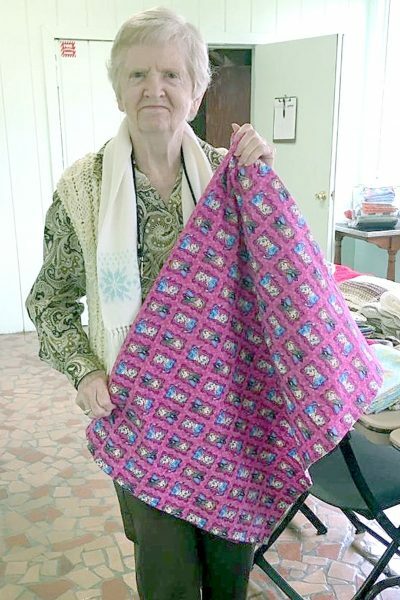 The 96-year-old Gibsonton resident has been joining other crafters there for at least 40 years for meetings of the Riverview Hobby Club. She genuinely looks forward to it. “I enjoy getting ideas from other members, socializing with them and making things like baby blankets (which she knits),” she said. Formed in 1953 by Edna Hollett, Edna Dawson and Tolly Dawson, the club promotes fraternization and conversation in an environment conducive to creativity. There are 20 ladies presently in the group. They come from Riverview and many nearby communities like Brandon, Valrico, Seffner and Wimauma and range in age from their 40s to mid-90s. Carol Grim, of Wimauma, agrees. A close-up shot of broomstick lace knitting, a combination of knitting and crocheting. The weekly gatherings are from 9 a.m. to noon and include members working on their various projects, free coffee and refreshments and a brief business meeting. Members meet year-round, but during June, July and August, they simply play bingo and do their crafts. There are no business meetings. Membership is $5 annually, and the ladies pay $1 per week to the club’s Sunshine Fund, which is used for miscellaneous expenses and an annual donation to the Hillsborough County Parks Department. 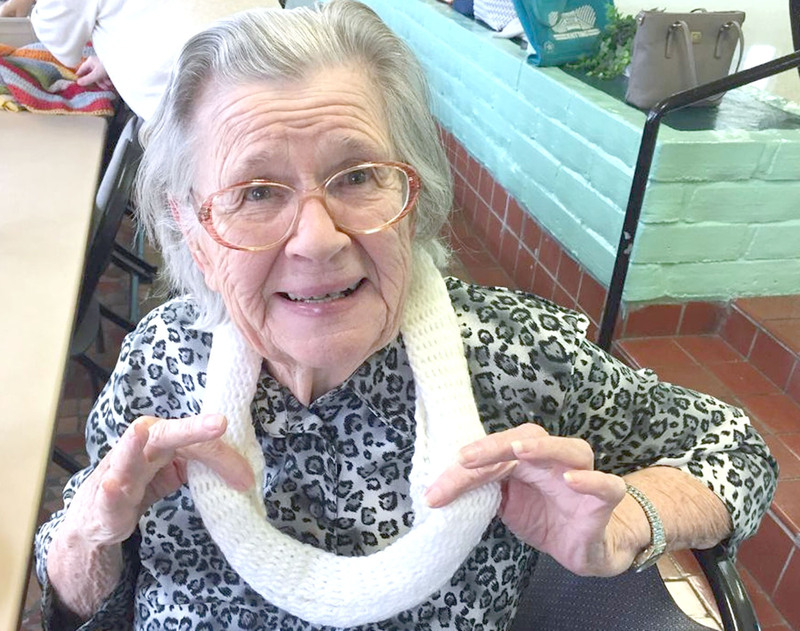 “We make anyone 90 and older an honorary member, so they no longer have to pay,” Cagle said. 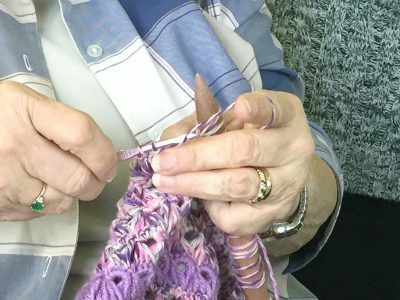 As mentioned previously, many of the things members make at the meetings or on their own are donated (at their option) to the following nonprofit organizations: Moffitt Cancer Center; Shriners Hospitals for Children; Brandon Regional Hospital; St. Joseph’s Hospital; the Central West Florida Chapter of Newborns in Need; and Alafia Village Nursing Home and Memory Care. 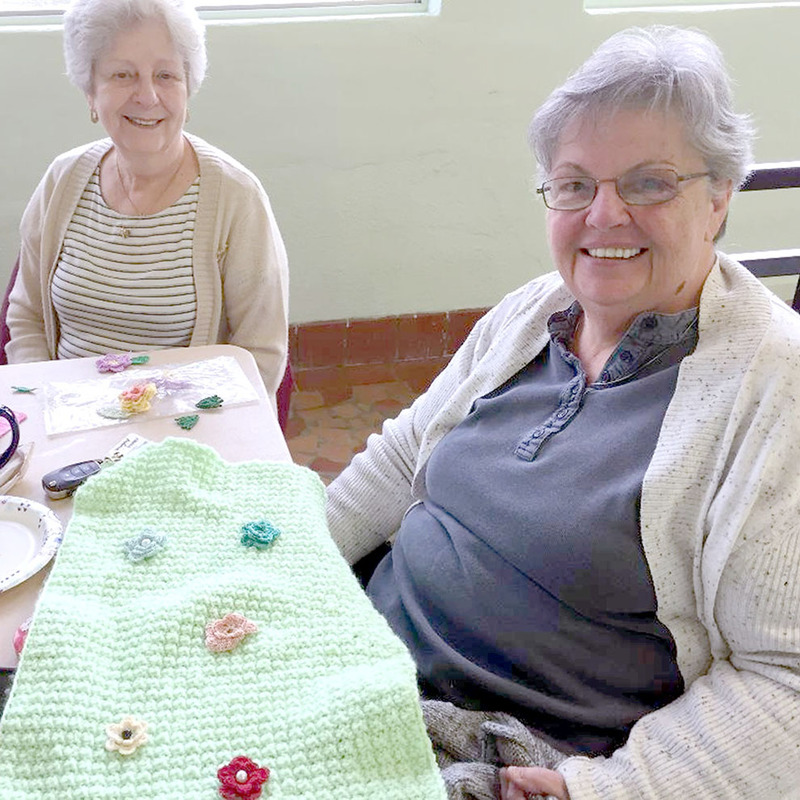 Sandy DiBruno, of Lithia, left, crocheted the colorful flowers seen here to be appliqued to a small blanket Valrico resident Nancy Alamia is making. Donations include handmade items like chemo caps, bibs and lap or baby blankets, newborn caps, various sizes of afghans, preemie hats and soft baby toys. “We also have people who aren’t members make things and come by to donate them,” Dillon said. The club’s next major donation at the end of February will go to the Moffitt Cancer, Shriners and St. Joseph’s hospitals and Alafia Village Assisted Living. 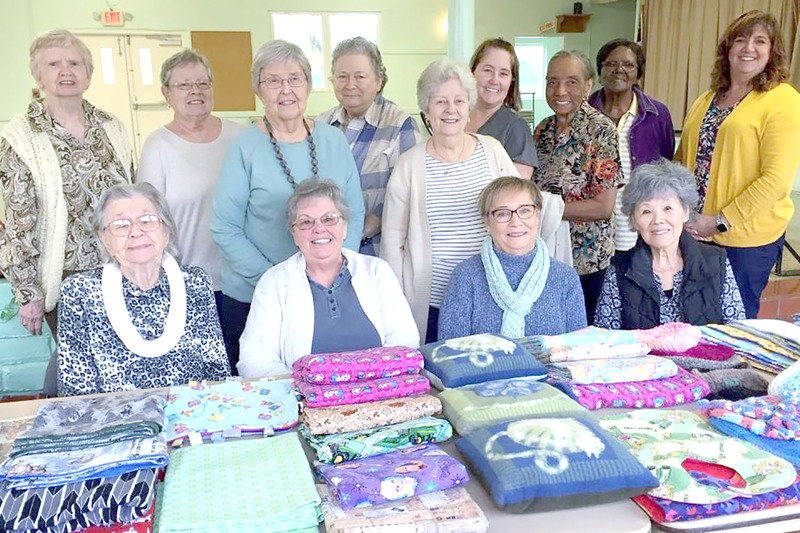 “Basically, we just need to keep our hands busy and get out of the house to be with friends, have coffee and snacks,” said Doris Davies, of Valrico. For information on joining the Riverview Hobby Club, call Cagle at 813-677-4527. The Riverview Civic Center is at 11020 Park Drive. Members of the Riverview Hobby Club gather for a group photo at a recent meeting at the Riverview Civic Center. The club was formed in 1953. 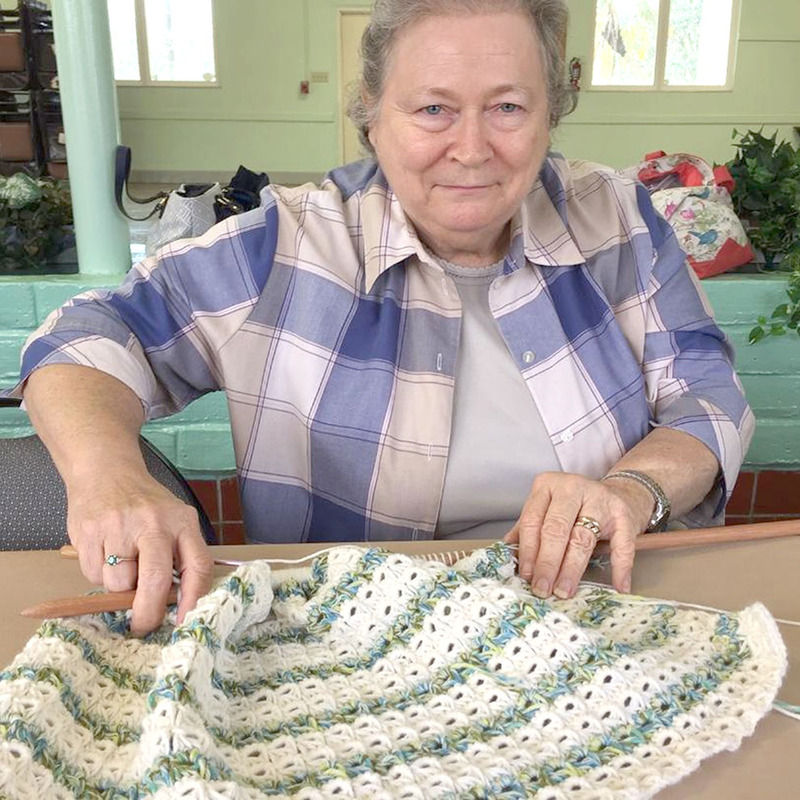 Carol, Grim, of Wimauma, shows a baby blanket she’s making using the 100-year-old craft of broomstick lace knitting, a combination of knitting and crocheting. Jeannette Carpenter, Seffner, displays a recently completed lap quilt she made to be donated to St. Joseph’s Hospital.